Players get two pucks, they drop the first into the game from the top. The puck will bounce through pegs and land in either the red, yellow or green slot. 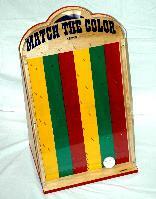 The contestant must then drop a second puck and match the same color to win the game.